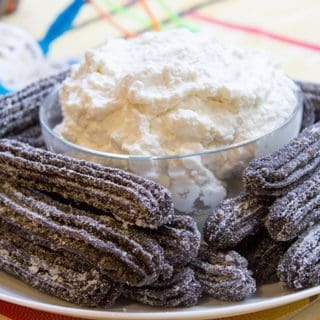 Oreo Churros are crispy, tender, perfectly chocolate-y and perfectly paired with Oreo filling whipped cream dip for dunking. The viral recipe made easy. Separate the cookies and the filling into two bowls. Process the cookies to a fine crumb in your food processor. In a pot, add water, butter, 1/3 cup sugar and bring to a boil. Add the flour and Oreo crumbs. Whisk together until fully combined. Add two eggs and whisk together again. In a piping bag with a large star tip, pipe 5 inch sections onto a parchment paper lined cookie sheet. Freeze completely (or a minimum of 2 hours) to preserve the shape and help the frying look perfect. When you're ready to fry them, heat 2 inches of oil in your large pot to 350 degrees. Add them in batch to the oil and cook for 2 minutes on each side. In a shallow bowl add 2/3 cup sugar. Drain the oil from the churros and roll in sugar. Add the heavy cream to your stand mixer with the whisk attachment. Melt the Oreo filling for 10 seconds to soften. Whisk until peaks form and add in the Oreo filling. Whisk on high until filling is incorporated completely. Refrigerate whipped cream until you are ready to serve.